Welcome to the February 2012 Edition of the HamSphere Newsletter. First of all I hope that you all have had a good start of 2012. HamSphere is flourishing with a lot of new stuff, so lets get right to it. This is one of the latest most wanted additions to the HamSphere virtual Ham Radio. From your built in Log Book you can send QSL cards to any logged contacts directly from the transceiver. Just select the QSO that you want to confirm, click the S button, select a QSL template and send it off. The QSL card will show up in the remote station's Log book immediately. Over 5000 QSL cards was sent the first week after launch so it is a popular feature. It will also turn up on your QSL card list on HamSphere. QSL Templates: This is probably the most important part of the whole system. With the QSL card template editor, which works in true WYSIWYG mode, you can upload any picture and then drag and drop the information fields to the card. You can save any number of QSL card templates for your QSL card selection. So start your HamSphere transceiver now to check out the new QSL system. We have now a brand new support ticket system that will assign a tracking-ID/case number to your support request. In this way we can channel your question to the right people without delays. Any user mailing requests to support@hamsphere.com will get a ticket so that no support case will be left open or forgotten. Included in the system you will also find a knowledge base which contains helpful information regarding different areas of HamSphere. If you feel that you have some knowledge in certain areas and would like to help out. There are needing users out there with technical issues in Mac, Linux or Windows. Sometimes the support can be about installation or sometimes involve just a simple password problem. Feel free to contact support@hamsphere.com if you are interested in helping out. 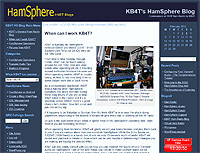 You can now get your own Ham Page on HamSphere reflecting your own call sign such as http://5b4ait.hamsphere.net. Why would you need a HamSphere Blog?. You might for example have something to say, show your shack, display QSL cards, conduct experiments, share family pictures, exploring new and fancy gadgets, anything that makes you happy. You have over 10 different templates to choose from. Rare DX Operators from the following countries have been active (And verified via IP-number) on HamSphere since the beginning of the year. A lot of patience, A bit of luck and the Right conditions. Unfortunately, DX Stations do not jump into your lap just like that - That is why they are called DX. You have to work hard to spot the rare DX just like on the real shortwave bands. Listen - listen - listen and be equipped with a lot of patience, and all of a sudden, it is there - the DX you have been waiting for. Henrik OZ1HLT reports that the new Java 7.0 seems to solve the problem with intermittent HamSphere transceiver stops that a few users have experienced. However, this problem only has affected a few users as far as we can tell. It seems to be related to Internet and its routes/peers. Worth noting is that Java 7 is still in beta-state. Android development will commence shortly on the newest Samsung phone. We will port the Java code to our best ability. Please follow Kellys blog to keep yourself updated. iPhone development is going a little slower. We compiled the source code on the latest Mac xCode development suite and it compiled without error. So it is looking promising. Some tests were conducted last week with the iPhone app, which is available in beta-stage.